I'm a winner! 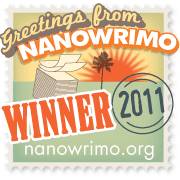 I just completed NaNoWriMo for the first time this year. Hit 50,007 words at 9:20 PM on November 30th, 2011. My novel isn't finished yet, but I'm 50,000 words closer to the end than I was a month ago! Woot! Now I can go back to working on craft projects. I'm sure I can find something to do for Christmas. Tis the season for making pretty little handmade gifts, decorating the house, wrapping presents... and playing Star Wars: The Old Republic. Oh yes, I preordered it. Better get some craftin' done before Dec. 20th when the Empire takes over my every waking moment.